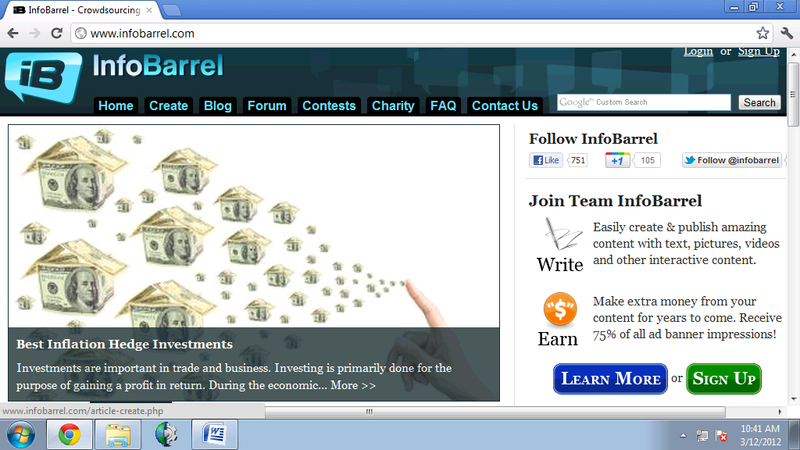 My article Best Inflation Hedge Investments is currently on the home page of InfoBarrel.com. It’s not my finest writing but at least it got featured. I only have a handful of articles and I’ve only been on the site for a few months. I’ve tried to submit previous articles for the home page feature but the articles weren’t picked. I’ve submitted a few articles again for this month and luckily, one was chosen for March 11 on the category Stocks and Investing. I forgot which categories and dates I’ve submitted the rest but I will soon know in the coming days whether they make it or not. There is no way to know if an article is chosen until the actual date. You just have to check the home page daily to see what’s featured. You can’t submit old articles as well. The site only considers articles which are written on the same month when they are collected. All articles for this month of March were submitted last month, February. Only articles written and published live last month can be submitted for the home page feature of this month. All submissions close by the end of each month. Featured articles remain on the home page for a specific period only. There are 6 which are prominently displayed. A new day means a new article to be highlighted on the spot light. Previous articles are then moved to the lower section of the page under “More Featured Reading” of which there are 12. As new days and new selected articles are featured, the previously highlighted ones disappear from the home page and are transferred under the Explore InfoBarrel section below. There are 12 categories, namely Auto, Health, Lifestyle, Business & Money, History, Sports, Entertainment, Home & Garden, Technology, Environment, InfoBarrel University, and Travel & Places. Under these categories, 6 articles are displayed and changes as new articles are featured. A featured article will then remain on the spotlight for 6 days, on the home page under More Featured Reading for an additional 12 days, and 6 more days under the category section. This gives a featured article up to 24 days in the limelight. New visitors, registered users, and writers can then have access to an article they won’t normally find unless they search all over the site. I for one regularly drop by the home page to see new featured articles. Going back to the Best Inflation Hedge Investments article, I actually wrote it over a year ago. It was for my very first mentor in web content writing. The buyer was no longer available so the articles were actually unpaid. She still paid us nonetheless, although it was a small fee. I already published in the article in HubPages a few months back. 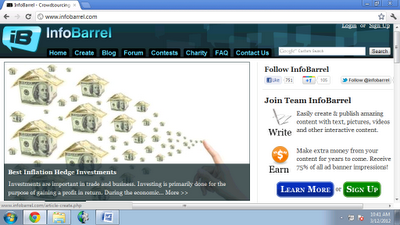 But since my first account was banned in the said site, I removed all articles and transferred them to InfoBarrel. More about this on the entry - My Account Got Banned from HubPages. Best Inflation Hedge Investments is only one in a series of related articles discussing about the possibility of a dollar collapse scenario, the debt crisis, investment options, gold demands, and more. All of them are now published through my profile Web Addict at InfoBarrel.com.